In A Life's Morning an honest and gifted man meets with ruin and death because it is impossible to walk about a big town with no hat on. His hat is blown out of the window when he is traveling in the train, and as he has not enough money to buy another, he misappropriates some money belonging to his employed, which sets going a series of disasters. The old saw is that as long as an author gives the characters and their world a sense of solidity, as Jane Austen does, we will believe in the conventions along with them. But I can only follow this so far, and I admit getting annoyed even at Austen's immensely solid characters when they are shocked at trifling breaches in etiquette. I understand that it all makes sense in context, but I have no great desire (most of the time) to read about people contorting themselves in a bizarre, corseted world. Which is, finally, a good way to describe much but not all of New Grub Street. Most of the book deals with people writing to support themselves in a society that makes almost no sense to me. Imagine a world where, purely through force of convention, literature is no longer a supremely impractical way to make a living - as I assumed it always had been - but the only possible labor for a man of education in a city without a fortune to support himself. A clerkship or any other sort of work would, it seems, be completely humiliating, so even people with no great love for literature churn out mountains of stories and articles and novels at incredible speed merely to pay the bills. Apparently this was an actual state of affairs in late 19th century London. Gissing himself wrote this novel in two months (it is 500 pages long) and much of it is taken, with small variations, from his own life. The main plot involves a struggling writer, Edwin Reardon, and his wife Amy. Reardon has written a few books that have done okay, but under the pressure of paying the rent and supporting a young child, he has gone completely dry. His wife doesn't understand why he can't just sit down and fill up the pages, and the tension over money and his productivity starts to put a strain on their relationship. I kept thinking, as I was reading, "Jesus, just get a regular job," but apparently even Reardon's wife regards such a step as utter degradation. She refuses to be married to any sort of common laborer, and the two separate when Reardon suggests that he give up on literature and go back to clerking. Gissing does make the setting and era entirely convincing - in Virginia Woolf's description, it is "a world of fog and fourwheelers, of slatternly landladies, of struggling men of letters, of gnawing domestic misery, of gloomy back streets, and ignoble yellow chapels" - but, as you can see, this is not much of an inducement to read a book. What has kept it alive, I think, is its other major plot, involving the relationship between Jasper Milvain, an up-and-coming writer, and Marian Yule, a lower-middle-class young woman who helps her father with his own literary work. We are meant to dislike Jasper, but I suspect that he got away from Gissing a little, because by the end of the novel he becomes an incredibly lifelike, almost emblematic figure. There is some strange, disturbing modern quality about him, something that I would call pure "above-averageness" -- he is a man who is entirely incapable of both heroism and treachery. He helps his friends when he can and produces pleasant and intelligent work. He is witty, genial, sensible, and clearly on the road to success. We recognize him as suited for the world, and as the sort of man that most of us would like to be (and perhaps, in many ways, already are); but there is also something repulsive about his sensibleness, about the complete lack of inspiration and grandeur in all that he aims for. But Jasper's is the time that is to come. Even with all of the focus on vanished convention - the obsession with marrying well and refusing positions beneath one's station - I think one can witness the birth of the modern literary world in this fat grim novel. From the success of a little paper called Chit-Chat, which is sold for pennies to people riding the streetcars, and caters to the so-called "quarter educated" (the paper has only tiny half-column articles with short paragraphs) to Reardon's failed attempts at writing a popular novel, we can see the mass audience beginning to take over the world of words. It is a world on the edge of a cliff, with many of the vices of the modern world and few of the virtues of the old one - and I've never quite come across its like in a novel before. Which is praise of a certain kind. So, although I doubt many people will thank me for the recommendation, I think New Grub Street is worth reading. 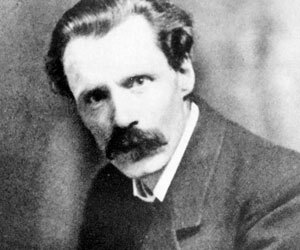 It has numerous flaws only partially attributable to the speed at which it was written: Gissing is not quite large enough as an artist to see past the world that he is writing about, and there are many sections where he seems to both attack and entirely accept the conventions of his time. But there is something about New Grub Street that is, finally, difficult to shake - and that is a rare quality even in books that I liked much more than this one.